What's durable, attractive, fun to play with and costs next to nothing? Why, empty laundry detergent bottles and milk jugs, of course! Don't believe us? Check out the photo collage below of various toy vehicles made from discarded household containers and bottle caps and plastic lids. Once the labels have been removed, the "vehicle bodies" don't even need to be painted over, which makes environmental sense as they will be easier to send for recycling once broken or once you get tired of them. 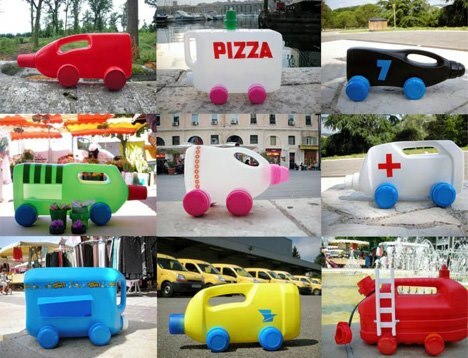 Designed by artist Martine Camillieri, these toy vehicles are a great example of what happens when creativity meets environmental responsibility. Empty bottles and containers could be reused indefinitely until they break, and then they could be sent for recycling. Although the artist did not provide instructions on how to make these wonderful toys, we can use the resources at hand to try to make toy vehicles with bottle cap wheels that really turn. Get an adult to help you drill holes in the bottom of the bottle where the axles of the vehicle should go. Be sure to measure the bottle first. If you drill the holes too high, the wheels might not reach the ground. You can make axles from used disposable bamboo chopsticks. Get an adult to measure the chopsticks and cut them into their desired lengths (slightly longer than the width of the bottle), and then glue the bottle caps to the chopstick using silicone glue, epoxy or other strong glue. Make sure you do it in a well-ventilated area, as the glue fumes can be very bad for your health. If you have the patience, you can also cut windows and hatches for your vehicle before decorating them with stickers or illustrations. Now you are ready to have a wheelie good time with your new toy vehicles! What are "E.M. Mudballs" and do they work?